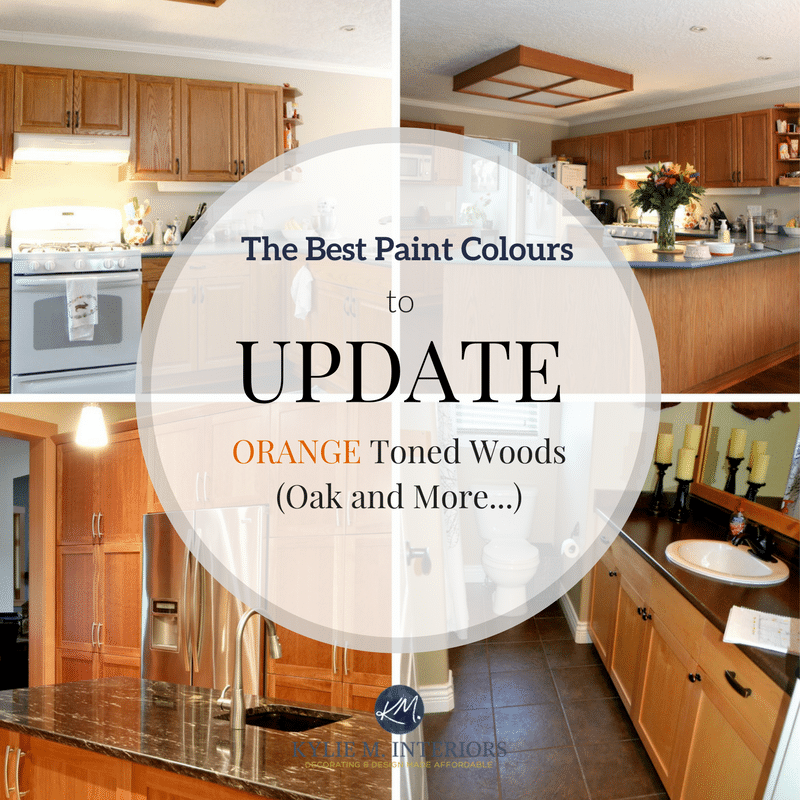 Partner Post to 5 Ideas: How to Update Oak Cabinets Without a Drop of Paint! There are SO many colours of wood in the world – virtually every colour in the rainbow it seems! And while some of these colours can be quite timeless, there are also many versions that can be challenging (understatement) to modernize and update. And why do I call them colours of wood not species of wood? Because wood is often stained a different colour than its roots (literally) suggest – so we’re going to base things on the overall ‘colour’ that you see – not the chronological history of the tree! This is going to be TREE-LY exciting, so let’s get started! Before you get into the nitty gritty, you need to decide whether you want to accent your wood or whether you want to blend or camouflage it a bit. 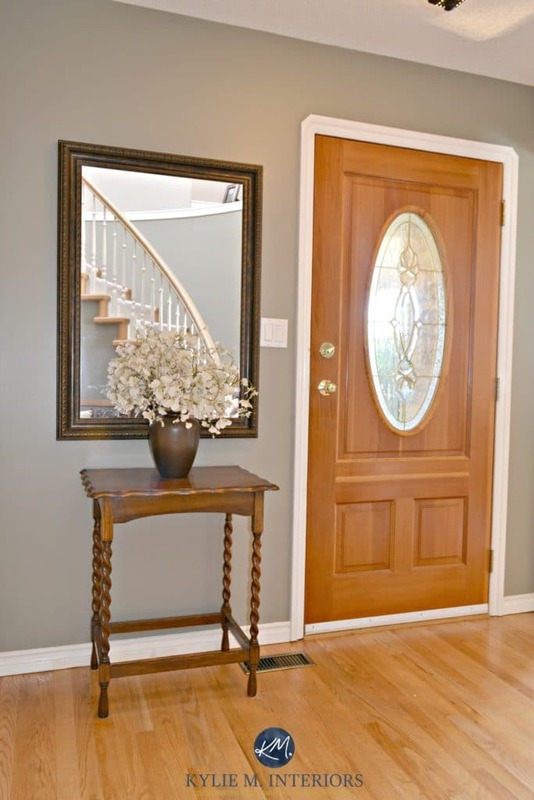 Paint colours that are a few tones lighter or darker than the wood tone can also help to accent. However, simply painting the walls a cooler colours regardless of depth will do a good job. Keeping the paint colour a similar depth to that of your wood is a great way to keep things seamless, but can be a bit bland feeling if you choose a warm or neutral colour. It’s better to go just a bit lighter OR darker than the depth of your wood. Yellow toned woods are some of the trickier ones to work with as they are harder to tone down (but accenting them is easy!). Some yellow toned woods can pick up a flash of pink or orange, but generally speaking, they are pretty darned yellow. STOP thinking of your cabinets as a wood and start thinking of them as a ‘colour’ – and your colour is YELLOW! AND REMEMBER, you need to take into mind your countertops, flooring, backsplash, LRV and exposure (north or south) when choosing a colour, so see if one of the options below will fit the bill! Softer Tan is a warm tan with subtle orange, yellow undertones. With its beige base, it would be your best bet to start blending those cabinets in, while still staying on the lighter side. For a soft, subtle look, Classic Gray is a nice slightly warm gray which won’t blend in, but certainly won’t ‘highlight’ your cabinets. I usually recommend darkening Classic Gray by about 25%, just to give it a wink more body. This is another fave. Edgecomb Gray is a subtle dusky undertone that can nod towards the pinkish end of things (without being REMOTELY pink), making it a LOVELY choice for light oak that has those undertones. The foundation of this colour is a gray with a solid greige/beige undertone. This colour would slightly neutralize light oak. Read all about Edgecomb Gray in its colour review! Gentle Cream is not as bright as the colour shown above, but it’s still a lovely way to create a room that is warm and inviting. With its almost ‘butterscotch’ undertones, this colour will sit pretty neutral with oak and won’t entirely camouflage nor accent. You can read more about Gentle Cream in it’s colour review. Silverplate is a cool, slightly stormy gray with a vague blue undertone. And sure, the blue might enhance things slightly, but overall it’s a great way to create a more modern look with your yellow toned wood (shown below). Collingwood is a beautiful greige (beige/gray blend) with that soft, feminine undertone that looks SO pretty with the more soft, subtle yellow tones (shown above). Sea Salt is a lovely complement to any oak if you’re looking for a fun and fresh look. Sea Salt is a light toned green blend with a gray/blue undertone to calm it down. Yes, it will slightly accent your oak, but it will look BEAUTIFUL! Read ALL about Sea Salt in it’s colour review. Gray Cashmere is a soft gray with strong green and blue undertones making it almost whimsical with its fresh feeling (leans more blue). It has more gray in it than Sea Salt so it adds a whisper of colour without being too powerful. While yellow toned woods tend to be pretty darned yellow, orange toned woods can have some yellow in them or even a touch of red – but the ‘base’ colour is orange. Make sure you stop thinking of your cabinets as a wood and start thinking of them as a ‘colour’ – and your colour is ORANGE! Muslin is a lighter beige base colour with a great mix of warm undertones, making it super flexible and easy to decorate with. Stone Harbour is a beautiful, classy way to subtly accent your wood tones. Adding a gray with a bit of brown and purple in it is a nice way to complement the orange tones of your wood without going quite as far as blue/green would. Wythe Blue is a beautiful blue/green with a subtle gray undertone and it will really come to life with your cabinets for an inviting and friendly look. Sandy Hook Gray is a greige with a decent green undertone. So, while it WILL accent the warmth of your cabinets, the neutral base keeps things a bit more in check. Sure, this will bring up the warm tones in your oak BUT it will look quite stunning in the process! Ellie Gray is a beautiful gray with a very subtle blue, almost blue/green stormy undertone that will accent but COMPLEMENT your orange toned oak. Red or cherry toned woods are the richest of the bunch, adding depth and colour to a room. However, if you are following trends, red is not on the ‘must-have’ list and most of my E-Design clients are looking to work with them, rather than fighting with them. Cherry and red woods allow for a lot of richness and depth when it comes to decorating. Cherry and red toned woods are often best accentuated by using opposites and medium toned warm neutrals – rather than trying to blend it in with dominant warm paint colours. While there are some lovely lighter versions, red or cherry toned woods tend to sit in the rich/dark range, so keep that in mind when choosing a paint colour as your colour can determine whether your room feels cozy and inviting (medium/dark toned paint colours) or fresh and clean (lighter paint colours). With a nice range of warm undertones, Kilim Beige is a soft, subtle and versatile choice. Proper Gray is a warm gray with a subtle brown/purple undertone are absolutely BEAUTIFUL with cherry toned cabinets and woods. Cardboard is an awesome, more rich golden beige tone (shown above). Abalone is a mix between gray, brown and purple. The purple is subtle but adds enough colour that you aren’t just dealing with ‘greige’ and light enough that it can help to off-set a bit of the visual weight of darker cherry cabinets. I love how the purple taps into the wood tones without being ‘obvious’ about it (shown below). Collingwood is a beautiful greige (beige/gray blend) with that soft, feminine undertone that looks SO pretty with cherry tones. Earl Gray will accent the wood a bit, but look super stunning and rich with its cool gray tones and subtle blue/green cast. Heather Gray is a beautiful gray with a cool green cast (warm green has yellow in it, cool green has blue in it). Still not sure what the best colour for your home is? Check out my affordable Online Colour Consulting and E-Design Services! Read More: How to Update Oak Cabinets Without a Drop of Paint! Thank you for this post- it’s very helpful! I wonder though.. If I chose gray cashmere as a wall color, what do you suggest for a trim color? Hi Shelley! For a fresh and bright look you could do Simply White which is a cleaner look than the traditional Cloud White. You could also look at White Dove which is a softer, more dusky version of off-white. And really, one of my personal faves is just regular old white! Now BM doesn’t do regular white as you have to tint their paints, but all other brands can do that for you. Thanks so much for this post. I have all golden oak trim and doors in my house with a paler oak laminate flooring. We have just moved our kitchen to our old living room and are planning to open up our whole living space. I have already painted my new (used) cabinets Amherst Gray, which I love. I love its contrast with gold/brass. My countertops will be Emerald Pearl granite–which is pretty dark– black with flecks of blue and white. I have a mix of stainless and black appliances– not as bad as it sounds. I am also making an antique hoosier cabinet part of my kitchen. An oil finish made it golden/red in color. Windows are mostly east and west, a little south. I am just really stuck on what to do for wall colors. Right now there are four coordinating shades of beige/brown that help tone down the oak. I would like to do something similar with shades of gray. Any suggestions? Hi, thank you for asking! When it comes to questions like yours I usually refer them to my Online Consulting, this way I can get more information and photos so that I can give you the best solutions possible! 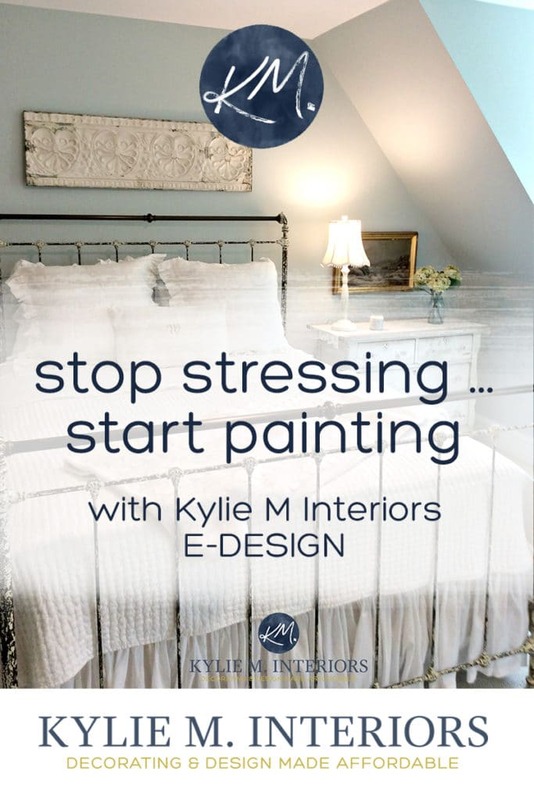 If this interests you at all, here’s the link… http://www.kylieminteriors.ca/online-decorating-design-services/ You can then email me at [email protected]eminteriors.ca and mention your comment and I’ll know who you are! Thank you for visiting my site, chat soon! I’m moving into a home where the oak trim is gorgeous, but will it clash with grey walls? Can I mix warm and cool tones? Hi Denise, no, gray and oak won’t clash, just keep in mind that grays with cool blue/green/purple undertones can be slightly enhanced by the warm tones of the oak. I lot of people lean toward warm grays for a softer, low-key look. There is oak trim in our 1969 ranch home. I’ve always toyed w/ the idea of painting all the trim/doors, but this seems so daunting and stained trim is easy to keep clean! I so appreciate the advice on your site about wall color to go with oak!! My living room currently is that green with brown/yellow undertones from the 90s. It is a good fit for our trim, but needs a fresh update! Can’t wait to sample some colors you recommended. Thanks again!! Well thank you Regina (look at my, catching up with comments – wahoo!). I’m so glad my advice came in handy and I hope everything turned out well fo ryou! Hello, your website is great! This post has been very helpful. I have a kitchen with orange/yellow oak cabinets and trim, darker floors and medium counter tops, and off white backsplash (they are all in the same color family and flow nicely). I am having trouble with what colour to paint walls as I have white appliances. I was considering gentle cream, but would that look off with white appliances? Hi! Gentle cream would actually be fabulous. The problem comes up with you get into ‘off-whites’ as they can look dirty compared to white. The great thing about Gentle Cream is that it dives head first into the ‘cream zone’ making it a non-competitor for the white. You are good to go my friend! Thank you very much for your helpful advice! My pleasure, glad it came in handy and thank you for visiting me! Ive been searching for this type of info on pinterest/houzz for about 3 years since we moved into our 1900s house with orange/red woodwork. Im redoing our bedroom and have it narrowed down to sea salt, rainwashed and palladian blue (we have wythe blue in our kitchen and i love it!) I have deep purple curtains in our bedroom and a large dark gray rug. Any advice for choosing one of those colors or maybe one i havent considered. Thanks! hi, i have light oak cabinets, black appliances and im looking to paint the walls in a blue. with a beige floor, what shade of blue would u reccomend? Im a little confused…you showed a lot of blue and green examples…but what if you dont like your oak! Most of the neutrals were in the gray family which can go blue…I absolutely don want green or blue…looks too 80’s to me with the oak. I am really struglling with this one! Hi! There should be some good ones to check out in there, including Muslin, Stone House, Balboa Mist and Navajo White. Now I’m working on a blog post to focus specifically on paint colours like those that won’t accent oak, but it won’t be ready for a few weeks yet! Hi Leah! I haven’t done one specifically for that, but within this post I did refer to warmer neutrals being a better way of not highlighting oak whereas greens/blues and cool tones can accent the oak. But i SHOULD do one quite specifically for it, shouldn’t I! Another great post! I’ll be waiting with bated breath for the upcoming post about oak. I’ve got a clear finish on red oak floors, and honestly, they read orange to me. To top that off, the trim and all woodwork (including my cabinets throughout) in my house are Sherwin Williams Dover White, which leans yellow. I’m beginning to think there is no grey option for me, and I’m SO bored of the color it’s currently painted, lol! Hi, terrific article! I’m having raw wood (oak) installed next week, staining it natural and getting dark chocolate cherry tables and a cherry fireplace. Vertical blinds are beige and burgundy. I’m thinking of doing a burgundy accent wall, but not positive what to do the other walls, especially the one where fireplace is going. I was thinking toasted almond, but not sure how that will look. What do you recommend? Thank you very much! Hi Andrea, thank you so much for checking out my site – I bet your flooring is going to look amazing! When it comes to questions like these I refer directly to my Online Consulting, where I could suggest 2-3 paint colour options for your based on a) photos of your home and b) a Questionnaire. We moved into a 1992 4 level split home a year ago. The walls were all originally painted pink!? and the last owners painted white over this, which bled through and gave all the walls a muted pink color. This really clashed with all the light oak that is throughout the home. I was perplexed to what color would go with the oak, and found your website! My husband hated the pink everywhere to say the least! THANKYOU! you were able to give us good ideas as to the color to choose. BTW, there are millions of colors out there, and can be so daunting as to which color and shade to pick. I stressed all last weekend, looking at colors and samples, and chips and spending hours and hours researching colors of paint. I was very brave! and i choose Benjamin Moore Sharkskin. Scariest thing, worse than buying a house! Not for the faint of heart for sure! I was on pins and needles all day, and when i went home, i didnt know whether to cry or just say WOW!!! The color just pops with all our white baseboards and trim! It turned out wonderful! It matches the oak beautifully, and we have bold walls, just like a new house! With all my dark brown/beige accents, it looks incredible! I am a true fan and believer of your webpage !!! Thank you for sharing your thoughts with us! I tell everyone about your site now! Finally someone who actually knows what they are talking about and is willing to share it too! A Kylie M Interiors Fan! Floors and trim are oak! Trying to find a grey that I did not blue, green, purple! Painted the bedroom Essintails grey Sherwin Williams. But it looks purple. Was thinking Mindful grey or light french grey, what do you think? We have turned our deck into an all-season room with 14 windows , cherry stained trim and cherry stained breadboard ceiling and floor. Everyone says to use grey on the end walls and the little spaces between the windows but both my husband and I love green so hopefully you will help me pick the right color. would sea salt work with orange/yellow oak floors/trim in a north facing room? Hi Jen, it could work, but keep in mind it will accent your oak floors as opposites do attract! Our 100 year old house is filled with oak trim, beautiful but challenging. Since reds, oranges, and yellows encourage conversation and appetites, I would like to paint my dining room a color that accomplishes this. Dining room has south-facing windows and an original built in oak china cabinet. Table and buffet are dark wood and the floor is light yellow oak (no stain,) Any suggestions? Is there a red I could use? Hi there! Could I use SW Agreeable Gray or SW Repose gray with orange toned oak cabinets and floor? Thanks for the advice! Hi Sam! Yes you can, you might want to also check out SW Accessible Beige though! That’s very helpful for my situation, thank you!!! I am absolutely LOVING all the helpful information you are sharing on your blog!!! THANK-YOU!!!! I am currently deciding between SW Repose Gray or BM Edgecomb Gray to paint the majority of my bedrooms, entryway, and hallway. Which one do you prefer? Can I use them both in different areas? Well if it were me I would lean toward Edgecomb as it’s softer and warmer, more of a greige, whereas REpose Gray is a warm gray, so it’s cooler toned…And you can use them in different areas, I wouldn’t say they are totally magical together, but they aren’t bad. If you want any insights where I can actually see your home, you can check out my E-design, it’s affordable and fun and I can spend some quality time with your home (via photos) and with you (via the questionnaire) to come up with solutions that work! HI Kylie, I am so confused. My house was built in 1989. I have a great room, kitchen, dining and family room. All Medium Oak ( not sure if orange or brown) cabinets and trim. I have dark teal (more green than blue) countertops and have always painted the walls beige or taupe. Beige ceramic tile on the floor. Boring! I want a drastic change. Changing the woodwork is out of the question. I would like to put in a grey barn wood floor, not sure if I can. I also want my house to pop! Please help me to decide what I need to do to change my boring decor. Hi Kylie! I love your website! What do you think about BM Revere Pewter with blond/orange parquet floors and wood work? Its a large room facing west with lots of windows. I recently ran across your video on accessible beige by SW. I have a bedroom, pretty good size that has some light ( plantation shutters sun never shines directly in facing north) therefore paint I have chose in the past appears dark green when in actuality it is a lighter taupe or tan. I have recently purchased a tuffed linen headboard and want to lighten up the room with new paint. What are your thoughts in me choosing accessible beige? 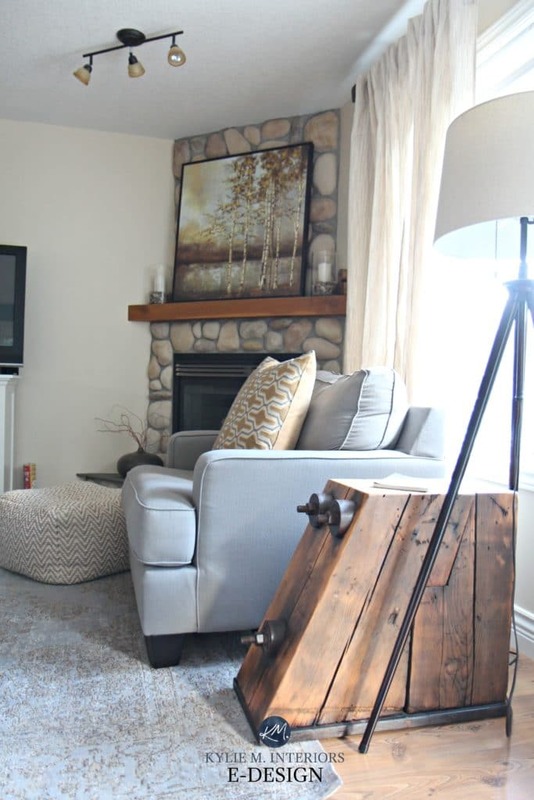 The rest of my home has warm earth tones with a rustic look. Feel lucky to have found this. Your advice to the other readers has been wonderful. My problem is having a mixture of woods. I have a teak parquet floor, and a beautiful 1920s vanity in a similar color of wood. The rest of the furniture in the room is Golden Oak. An addition there are window shutters and closet doors made of yellow pine. Is there any way to pull this room together? What color walls is the main picture I’m seeing on Pinterest? Bedroom with two chairs in the nook? Thanks! Hi Catherine, I BELIEVE that was BM Sea Haze 🙂 It was someone else’s image, which I’ve since taken off. I hope that helps! Would Balanced beige with a white dove trim go with dark oak stained doors in a open floor plan ? If not what would suggest? 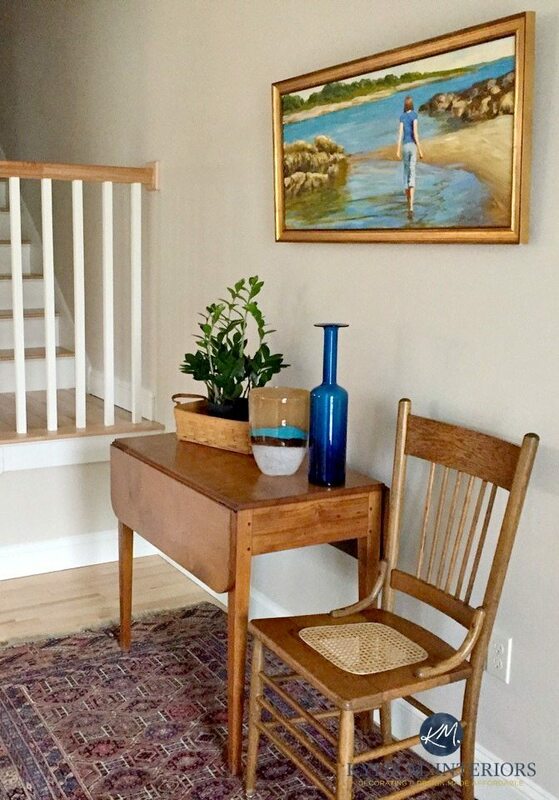 What is the paint color used for the main photo for the blog post ? Looks like a pretty green grey. Love it! First, I really enjoy your posts! So much good information. What do you think about painting kitchen cabinets the same color as the walls? I have vaulted ceilings and semi open concept home; I’m contemplating painting both the walls and cabinets wool skein. Floors are medium oak. Hi Marty, yes it can look good! Because you will be changing sheen from walls/cabinets/ceiling, that can provide a subtle shift that can really play nicely with a colour! Hi Kylie! Loving all of your posts – so much more than simple inspiration. You really help someone to understand how color works! I’ve been loving cream shades for my open kitchen-dining room (was painted a horrible dark green by previous owners and is North-facing), but I love the Kilim Beige above! Wondering how it will look in a room with northern light. I really want to brighten and warm it up, which shouldn’t be too difficult as I have cherry cabinets, cherry flooring and a large bay window. It looks great in the above photo, with high light, but I see that it has a lower LRV than the others I’ve been sampling. Do you think it will flatten too much in Northern light? I want to avoid a bland brown-beige kitchen and may go with Gentle Cream instead! Also – I have several ideas of paint colors I love (most of which I discovered on your blog) and would like throughout the house, but I’m not sure how to make it flow as I like a few different decorating styles (romantic, french country, traditional). Which e-design package would be best if I already have several colors I’m considering? Is there ever a deep red/wine color that could be paired with a darker orange toned wood trim? The previous color was a green color, however I tend to lean toward the darker, richer colors. Hi Terri, thank you for your note! I actually have an Edesign business that I’ve created for questions like yours! 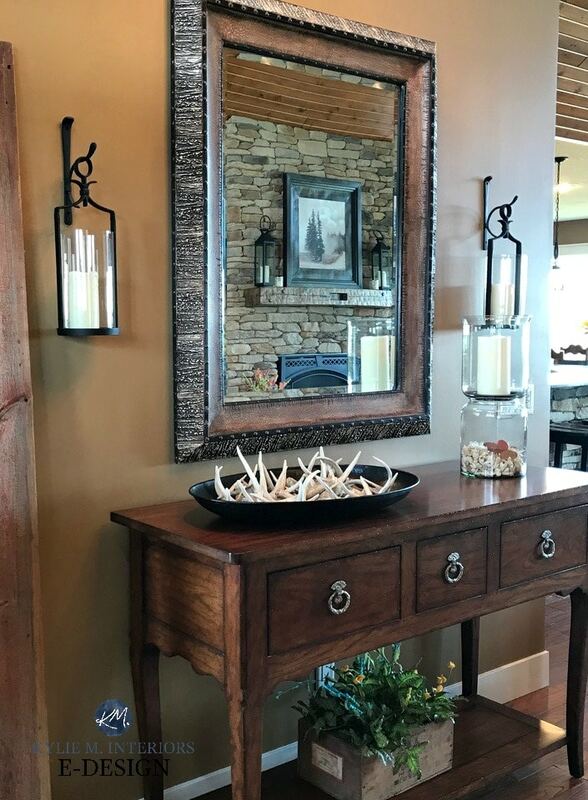 I try to give as much complimentary info as I can on my blog posts and if that doesn’t work, it might be time for a closer look, this way I can see your furnishings, flooring, etc…otherwise I’m totally guessing! Hi! I have red oak cabinets in my kitchen with browns/ blacks/tans in quartz counter. What color would go good with those colors and would another color trim look good? I want to change and update my trim in my house. I have a bay window in my living room and have the oak trim throughout my house. What would you suggest colorwise? Totally on the struggle bus. We moved and all my previous furniture and wall colors seem to clash in the new northern lighting of the house! Your site has been so helpful! Based on this article would you say that a taupe (to be exact SW Taupe Tone) will tone down deep cherry/mahogany furniture? Or is that just too much? Oh Brittney, I FEEL YOUR PAIN! We just moeved 2 months ago and our house is 100% north facing and DAMN it’s a cool gray/blue light. I knew that before we bought it, but arghh – I miss my southern light! And yes, getting into the taupe end of things, those with a slightly stronger red in them (or slightly pink/purple) can help to tone things down a bit, whereas if you did blue/green, it would enhance the cherry furniture…I might like to see a touch more of those undertones than Taupe Tone has, but it’s a good place to start! Thank you for any words of decorating wisdom you can pass along! Thanks again for the helpful advice! Is there a Sherwin Williams color that is close to Classic Gray? I’d love to use it since our cabinets are similar, but Sherwin Williams is more convenient for me. Thanks! Thank you so much for this article, it reassures us in our choice of Classic Gray for our MCM home. I’m torn on a ceiling color any suggestions? Chantilly Lace, White Dove or Simply White??? Hi Katie, I might actually look at Oxford White!